The Angolan border authorities at Luvo (as everywhere else) were fine; it soon became apparent that one would have to speak Portuguese (again thanks to Julia) or communicate via gestures if we were to make ourselves understood in Angola. 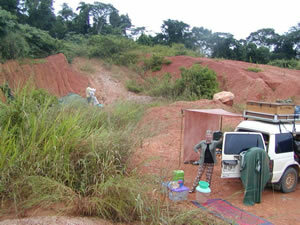 We motored on reasonable piste through Mbanza Congo and almost to Tomboco before we camped in a local quarry for our first night's sojourn in Angola. Next day the good piste deteriorated, then badly pot-holed tarmac and rain damaged dirt road through forests of Euphorbia trees and Baobabs, to N'zeto. Angola's past conflict was brought home to us very sharply as we motored along roads where the fields on either side were marked by red and white striped 'mines' warning signs. 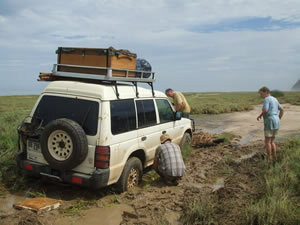 Not the place to stop and go off into the bush for a 'comfort break'. In N'zeto we bought a big Corvina fish straight off the beach, intending to camp again that night. 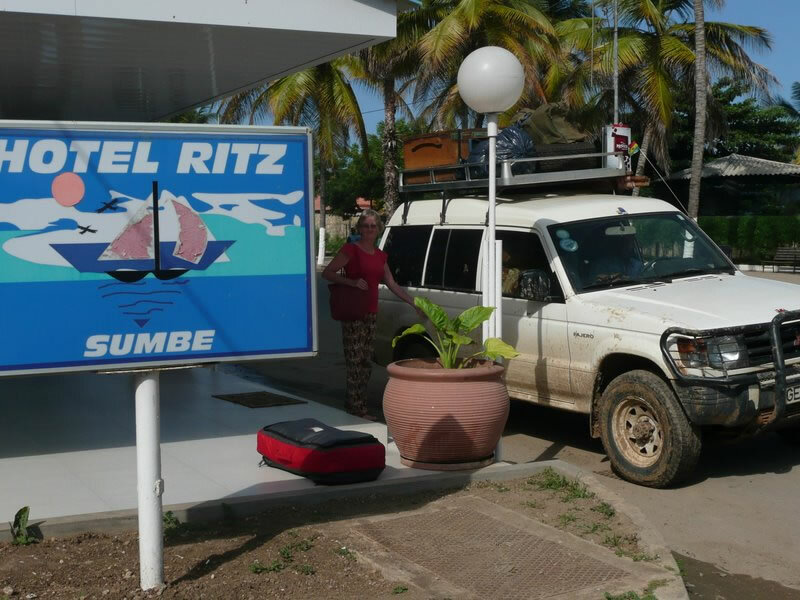 We drove several more hours and finally took refuge in Hotel Ambriz and had the fish cooked at the local restaurant for our supper and then crashed out exhausted after a day of driving on some of the most awful roads imaginable. A long drive next, passing through Luanda and on a further 100 kms, on wonderful tarmac, to camp on the beach at Cabo Ledo; we had a fantastic campsite on a completely deserted beach, reached by a track down the escarpment; as we watched the sun go down we ate home cooked chicken in groundnut sauce accompanied by a glass of red wine and went to sleep with the sound of the waves crashing onto the beach. We woke up in the night to the sound of rain, rain and more rain. 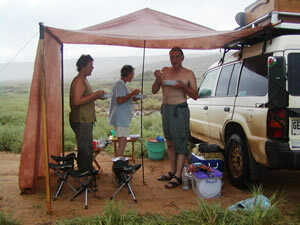 We ate breakfast huddled under a dripping awning, surrounded by sea mist. 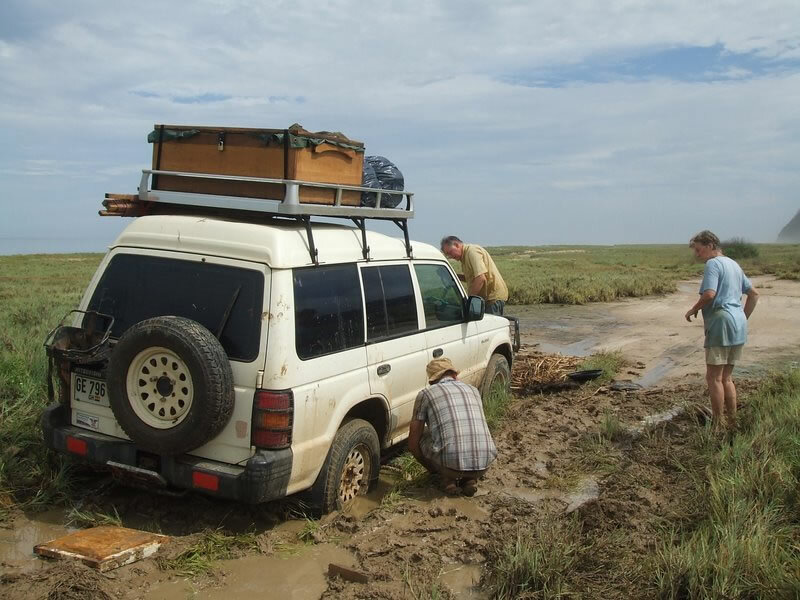 After an extremely wet pack up we set off up the track back to the road but it was too slippery even for Mitzi to get up; so we drove along the beach a little way but got well and truly stuck in the mud – axle deep. It took a grinding 4 hours to dig out and jack the car up so that we could pack all the flotsam and jetsam that we had collected from the beach under the wheels to give it some grip. This included an old piece of thick ship's netting, 2 pieces of large tow rope and an old refrigerator top. At last we managed to get onto more solid ground and drove back to the bottom of the escarpment track. By this time the rain had stopped and the sun was rapidly drying out the ground; we decided to wait a further 2 hours for the track to dry and then make the attempt. B, J and I walked up whilst Nigel drove. He made it through the first tricky bit whilst we watched and directed him. The second bit was going to be even trickier so he took a run at it and had almost got to the top when the back wheels slithered sideways and Mitzi slipped back sideways across the track – stuck again. Julia and I were sent off to walk the rest of the way to the road to see if we could summon help whilst Ber and Nigel began to dig out again. After 15 mins we had almost got to the road when we heard the wonderful sounds of Mitzi whirring up the track behind us with two grinning faces in the front seats. They had managed to dig out a load of clay, reverse a couple of metres, and were able to get onto solid ground and finally get up the hill. Good old Mitzi again. What a relief! 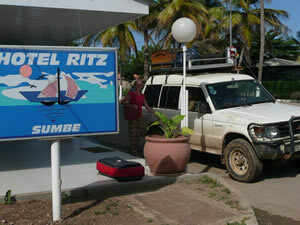 We made it as far as Sumbe on the coast and then found a hotel, ‘The Ritz' (the cheapest - $112!) - Angola was so expensive; we just had a beer, showered (in that order), ate and then crashed out. Heaven knows what kind of guests the hotel thought they were getting because we and Mitzi were covered in mud and looking very dishevelled. Next day we had a great run to Benguela, an old Portuguese colonial style coastal town. We passed through the edge of Lobito, reportedly a beautiful old colonial gem, but all we saw was the miles of grey dust-covered dwellings clinging to rubbish-strewn cliffs. In Benguela we stayed at 'Nancy’s English School and Hostel' which really was a little gem; we were able to clean and dry off all the wet and muddy gear and give Mitzi a really good clean up too. Here we met Claudia, a very pretty young Italian lady who was working in Benguela for the Ministry of Agriculture, on Land Rights, establishing titles and local ownership . She spoke perfect English, Portuguese, French and a few other languages besides. We all went out for a meal in the evening and Claudia was such an asset. She drove us in her own vehicle, suggested a good restaurant, helped us with the Portuguese menu translation and was incredibly good company. As we had so much stuff to clean up and our blog for DR Congo to write up, we decided to spend another night at Nancy's and so met up with Claudia once again; this time with 3 of her friends. Laurie, a Belgian, who worked for Handicap International in Lubango (where we were going to stay the next night) very kindly offered her own house for us to use. A very jolly gathering was enjoyed at the 'Todo na Braza' ('everything grilled'). Whilst at Nancy's we also met Jens, a German, who was travelling from Luanda to Johannesburg by bus, trailing a wheelie suitcase behind him! Wednesday May 13th- left Benguela for Lubango. 2 hours of really good tar road was a dream. Not to last however; for the next 4 hours we criss-crossed a tantalising newly constructed but unfinished road on a rough, sandy piste road . 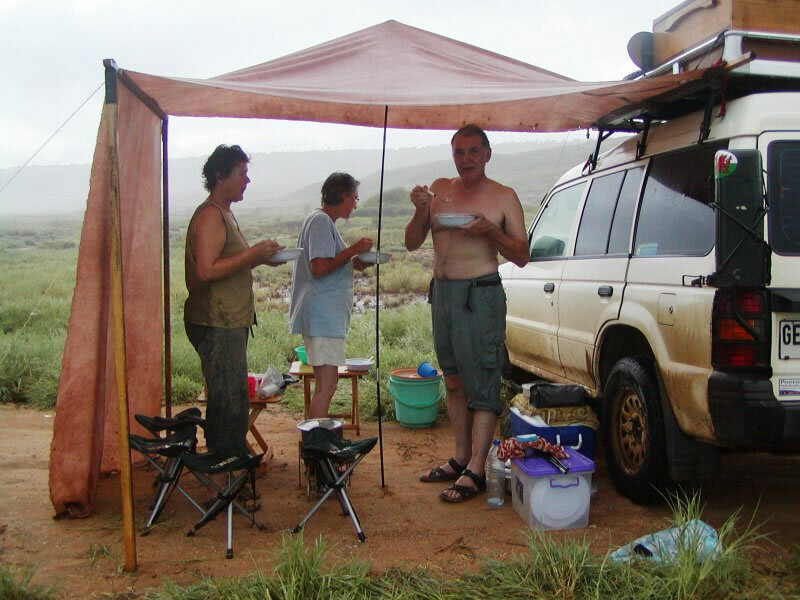 By the time we reached Lubango and Laurie's house, it was raining. 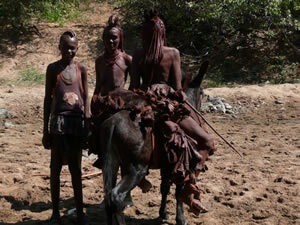 Lubango is set at about 5,500ft on a plateau in the shadow of a large escarpement. The cool climate was very pleasant and the town well organised with flowering flame trees lining wide streets and there were signposts! We had a bit of a dilemma in Lubango where we could have gone to the immigration office to try to get a visa extension. Our transit visa for Angola was for 5 days, and here we were still in Angola on our 7th night with no hope of reaching the border for at least 2 days.We decided to simply carry on and take our chances at the border - heading for Ruacana Falls, one of the quietest border crossings. Heading for Xangongo the following morning we had 130 kilometres of excellent tar road which then turned into a mixture of bad potholed tar and good and potholed piste. We stopped for a drink at Cahama and saw huge lorry loads of netted onions and potatoes coming up from South Africa destined for Luanda; everything is very expensive in Angola and there is obviously money to be made in onions!. The good tar road resumed at Humbe until Xangongo where the Chinese are building a huge new bridge over the river Cunene. The Chinese were all over Angola: building roads, railways, football stadia, bridges, housing estates etc; the tragedy is that every vehicle was Chinese, was driven by a Chinese, and almost all of the labour was Chinese - denying the locals a chance to earn a wage and sustain their families - it is criminal really! Here we turned off the main road onto an almost non-existent bumpy track for Ruacana. We knew we weren't going to make the border before nightfall so we bush camped just south of the small village of Nualila.We feasted off mushroom and chorizo sausage risotto, washed down with a bottle of beer. A perfectly clear sky gave us the most magnificent view of the stars - it also heralded our coldest night so far, we were absolutely freezing overnight!! Just a short drive to the border with Namibia - but what a drive! Alongside us was the River Cunene and the Calueque Dam and the track we were on suggested that we were travelling through the rainy season flood plains. At Calueque we stopped to pick up bread and biscuits to use up some of our Angolan Kwanza, and to have a cool beer. (9.45am !! getting into bad ways). The track took us through Mopane woodland - interspersed with baobabs - just like driving through South Luangwa in Zambia but without the animals. It was a pretty varied drive crossing dry sandy river beds, gravel tracks and rocky gulleys. It was in one of the sandy river beds that we came across 3 Himba women to whom we gave water and were allowed to take a photograph. Along the way we saw Lilac Breasted Rollers, Coucal, Egrets, Wydah birds, Hornbills, Hoopoes, Red billed Stork, in fact more birds than we ever saw in the whole of our 2 years in Ghana. We finally arrived at the border post in Ruacana at lunch time. Ruacana Border Post - We greeted the border official like friends and Ber offered them a few cigarettes (we had bought a few packets in Burkina Faso before we left, just in case but never needed to hand them out). We had decided not to mention anything about our visa overstay and just see what happened.The Immigration official took our passports, wrote everything down very slowly and studiously and waved us through. Phew!